The Paraguay midfielder is keen to move to the Premier League club, despite late interest from Napoli and Internazionale, and is due to arrive for a medical on Wednesday or Thursday. There are issues to resolve before the transfer can be sealed, understood to include the structure of payment and bonuses. But personal terms have been agreed and Rafael Benítez is hopeful of making his first signing of the window. Newcastle’s manager suffered the latest in a series of transfer setbacks when the transfer of the Lazio full-back Jordan Lukaku fell through. The club are reported to have held talks with Benfica and Monaco over loan moves for the midfielder Andreas Samaris and defender Antonio Barreca respectively. Is the current @NUFC transfer record (£16.5m for Michael Owen in 2005) about to be broken? Club has agreed terms with @ATLUTD for Miguel Almiron. Paraguayan attacking midfielder reportedly travelling to UK for medical. Fee £20m. Miguel Almiron has landed on Tyneside via helicopter in the past 5 mins ahead of his £21m move. Yes, I think it’s going to happen. Almiron has been here on Tyneside since yesterday afternoon. He started his medical late yesterday afternoon and was up at the training ground. I expect him up at the training ground again later today to finalise the deal. We’ll have to wait and see as to whether he actually trains with the squad but Rafael Benitez and Newcastle are very keen to get that one pushed through very quickly. The deal is for £21m. I’ve been working up here in the North East for five-and-a-half-years and it’s by far the biggest transfer business I’ve seen Newcastle do. Mike Ashley is keen to try and keep Benitez, who has got just a few months left on his contract, at the club. 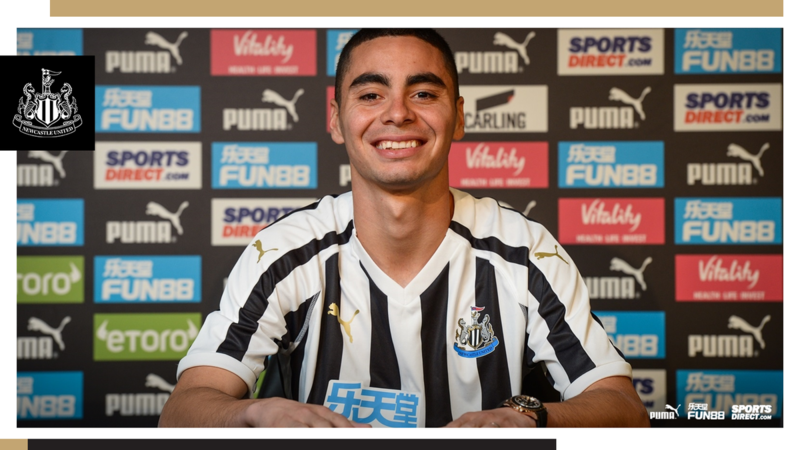 On top of Almiron, Newcastle have another player in today. Antonio Barreca arrived at tea time yesterday and met with club officials. He’ll finish his medical later on today and we can expect an announcement on that one. We understand Newcastle could yet add more. They are looking for a midfielder and are in talks with Andreas Samaras, a Greek international from Benfica. They could yet make a move for him if Isaac Hayden completes a move to Aston Villa. That’s three and there’s a potential for a fourth. Benitez told us a few weeks ago that he wants another winger.